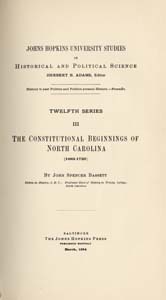 John Spencer Bassett, 1867-1928 The Constitutional Beginnings of North Carolina (1663-1729). The Constitutional Beginnings of North Carolina (1663-1729). Baltimore: The Johns Hopkins Press, 1894. Constitutional history -- North Carolina. North Carolina -- History -- Colonial period, ca. 1600-1775. North Carolina -- Politics and government -- To 1775.